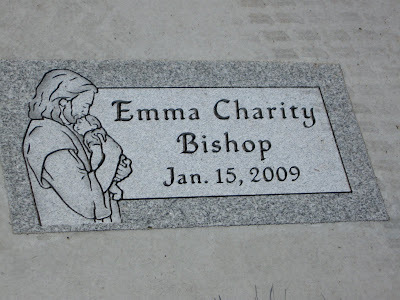 I don't know why, but we kept putting off getting Emma's headstone. But we finally picked it out and ordered it about a month ago and last week I got an email saying that it was in. We went as a family after dinner yesterday and saw it. It's small and simple, but so was Emma. I really like it. WHEN: Thursday, July 16th from 6 to 9 p.m. Come whenever you can during that time period and just get as much done as you can! WHO: Anyone who can! You don’t need to be super creative (although you can be) to be of help. Feel free to invite family and friends to join you! WHAT TO BRING:The most crucial supplies to bring will be paper cutters and adhesives. We will have some there, but if we have a good turn-out, you will have to take turns using these items. Also, if you have any old scrapbook supplies you wish to donate or that you wish to use, feel free to bring these and share them with others. We're continuing to chug along with these scrapbooks, but there's still lots to do! A big thank you to all who have helped thus far! You guys are the best! 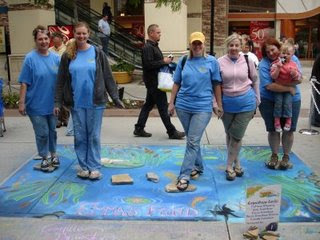 Each year the Utah Foster Care Foundation hosts a Chalk Art Festival up in Salt Lake. I had never heard of it before until my friend Camille told me about it. Some of you may remember her, she hosted one of our giveaways with a name drawing. You can check out her work here or here. As you can see, she is an amazing artist! She has participated in the Chalk Art Festival for a few years now and this year she contacted me and asked if it would be okay if she did a little tribute to Emma. 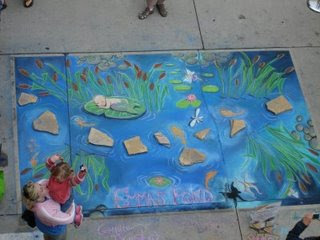 She called it "Emma's Pond." I was touched that she would think of doing this for us. Unfortunately, the festival was Friday and Saturday and I was camping all last week and didn't get home until midnight on Friday and then it was raining all day Saturday so I never went up to Salt Lake to see it. But Camille posted pictures on her blogs. So check out Emma's pond here and here. A big thank you to Camille and all those who were working with her! WHEN: Thursday, June 11th from 6 to 9 p.m. Come whenever you can during that time period and just get as much done as you can! WHAT TO BRING: The most crucial supplies to bring will be scissors and adhesives. We will have some there, but if we have a good turn-out, you will have to take turns using these items. Also, if you have any old scrapbook supplies you wish to donate or that you wish to use, feel free to bring these and share them with others. We're continuing to chug along with these scrapbooks, but there's still lots to do! A big thank you to all who came last time and who have worked on some on their own time! You guys are the best! P.S. For those who were able to come last time - do you have any suggestions for a better way to organize all of the paper and embellishments? I feel like everything was just scattered about and a lot of stuff got neglected because it was buried. The only thing I can think of is to start with more tables to begin with, but then I'm afraid it'll feel weird to have tables full of stuff surrounding you. Does that make sense? Anyways, any suggestions? P.P.S. Feel free to bring kiddos along. I brought my boys last time and a couple of other people did as well and they all played together with my husband (love ya Husband!). P.P.P.S. Will snacks entice you to come? I've been thinking a lot lately about what I should do with this blog. As I've said before and as some of you know, I have a private family blog that I've had for many years. I started this blog mainly because I thought it would be too difficult to blog about Emma and about the fun times we were having with our boys right next to each other. However, as time went on, we found great joy in Emma and I didn't feel like it was a weird thing to blog those things together. But at that point, I had already started this blog. Not only that, but this blog had reached across the country and even to various parts of the world and I was very grateful that Emma's story was being shared and appreciated by so many. Now it's been almost 5 months since Emma has left us. Wow. Sometimes I wish time would stop and the world would remember our sweet little girl. While we shall never forget Emma, the world moves on without her. We now face the awkward question of "how many children do you have?" While I don't like to make others uneasy, I do like to mention Emma because I don't want her to be left behind. Having said all that, I'm not quite sure what to do with this blog now. I would love to continue to share Emma's story with the world, but Emma's story is the story of our family moving and continuing on in this world and I blog about that in my other blog. I can continue to blog about ups and downs and I can continue to blog about the scrapbooks (because I still need help!) but I'm not sure of what else to blog. I think for sure I'm going to take some time to get Emma's blog more user friendly. 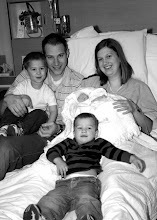 I realized that I've never put the links to all of the other anen mom's blogs up here and I would like to do that. If you're reading this and you are a blogger of a baby with anencephaly, please leave a comment with your blog address. I have them all in my google reader, but it would be so much quicker if the comments were just left. And if not, then I will just go through my google reader and do it. I think I'm also going to put up links to specific posts on the sidebar so that people who come to this page for the first time can get a better idea of some of the thoughts along the way. I'm also going to be publishing this blog into a book (probably through blurb) so that we can have that as part of our memories of Emma. You are going to be a big sister! A HUGE thank you to everyone who came and made scrapbooks with us today! I had no idea if one person or 40 people would show up, so I was very happy that 20 people were able to come! The only problem, however, was that I underestimated how long one scrapbook would take. I figured that if someone came for most of the time, they could get about 4 scrapbooks done. Oh how I wrong I was. There was only one person who got 2 scrapbooks done, and she did them simultaneously. Everyone else was able to get 1 done. But don't get me wrong, I'm so grateful for those! It just means that we have tons more to do! Several of you e-mailed me and told me that you couldn't make it but you'd love to do some on your own time, and that would be wonderful. Also, we will for sure be planning another get-together to get more done. But the ones that are done look amazing!!!! I love them all! So a huge thank you to everyone! And I guess I was so wrapped up in my own scrapbook album that I completely forgot to take pictures of us all scrapbooking away! Oh well, I'll just have to make sure I do take pictures next time we do it! Monday, May 25 (Memorial Day) between 8:30 and 11 a.m. Come whenever you can during that time period and put together one or multiple albums. Anyone who can! You don’t need to be super creative (although you can be) to be of help. Feel free to invite family and friends to join you! The most crucial supplies to bring will be scissors and adhesives. We will have some there, but if we have a good turn-out, you will have to take turns using these items. Also, if you have any old scrapbook supplies you wish to donate or that you wish to use, feel free to bring these and share them with others. We’re hoping to be able to get most if not all of these scrapbook albums done in this session, but we know we can’t do it alone. We hope you’ll all make an effort to come and join us. If you have any questions, don’t hesitate to ask. First of all, I just wanted to say congratulations to my sister and brother-in-law and a big welcome to the world to my newest niece! Now, as for scrapbooking - we're not doing it this Saturday. So, for those of you planning on participating, would you rather do it this Monday in the morning (Memorial Day) or next Saturday (May 30) with the possibility that it may have to be delayed again if we do it next Saturday. Thoughts? 1. Thank you to everyone who has given me positive feedback about my KSL High 5. It wasn't as embarrassing as I'd thought it would be (considering I hadn't showered) and it's kind of fun having people both that I know and don't know tell me that they saw me on TV. 2. On Saturday there was a Remembrance Walk for those in the area who have lost their babies or small children. It was definitely a tear-jerker. It makes me want to move to an area that doesn't have any of these amazing resources of support that we have so that I can start them there and bless others' lives with them. If you're in an area that doesn't have these kinds of things, feel free to e-mail me and I can let you know all of the many resources we've been blessed with so you can possibly get some stuff started in your own area. 3. In my church, The Church of Jesus Christ of Latter-day Saints, there is no paid preacher or pastor. The ones who speak or give talks are members of the congregation. I was asked to give a talk this past Sunday (Mother's Day). Because of time constraints, I only gave the first half of my talk, which was basically my story of motherhood. I feel pretty good about how it went, but sometimes I wonder if I come across as always talking about myself because of the fact that I bring up Emma's story so often. Tim doesn't think so, but he's an amazing husband who loves just about everything I do. 4. Scrapbook albums. For those of you who are new, let me go back a bit. After Emma died, the hospital gave us several things for mementos. One of which was a pre-made scrapbook album. I also had a cousin-in-law give us one. I loved both of these books and it was so nice to just print pictures and stick them in and then have them ready for display at Emma's funeral. However, the lady who runs the whole bereavement support thing said that they don't have very many left and the original ones were all donated. So I have had a few different scrapbook stores and people donate scrapbook supplies and/or money and we now have everything we need to put these together! So we're thinking that on Saturday, May 23rd sometime in the morning, anyone and everyone is invited to come join us to put these together. Whether we know you or not, you're invited! I'll be posting more exact details sometime next week (like place and time), but tentatively put it on your calendars. The more the merrier! 5. Pregnancy and birth in general can really mess with your hormones, but since losing Emma, I didn't realize the tremendous swing there really would be. My self-esteem has had some of it's highest highs and some it's lowest lows over the last little while. Lately I've been on the lower end and I've been trying to figure out what will help me the most to kind of get out of my low self-esteem funk. One thing I've decided is that I'm going to be checking and posting on blogs less. So I apologize, but Emma's Story will not be updated as often as it used to be (which used to be every couple of days). I also apologize for the lack of comments I will be leaving on others' blogs, but at this time I want to spend more quality time with my boys and husband, as that is what truly makes me happy. 6. Just a friendly reminder that the Running With Angels 5k is this Saturday. We are already signed up and ready to go! Come run with us (or you can run and then leave us behind when we have to start walking)! Click here for my original post about it. I also wanted to give credit to Julie Whiteley for many of the photos. She's given us permission to use them however we'd like, so my sister sent some to KSL 5 and they attributed them all to her. I really don't think I can thank you guys enough for the love, the support, the prayers, and everything else that you've shown us over the last while. I know I say it a lot (that I can't thank you guys enough) but that's because it's true. You are all so wonderful. I also wanted to thank those of you who have e-mailed me and shared with me your stories. The e-mails aren't flooding in, but I have gotten quite a few e-mails from people across the globe who have similar and not so similar stories. I am so grateful for the stories and words that you have shared with me. They have touched my heart and I'm happy to know that Emma's story has touched your hearts as well. So once again, I say thank you. And for those who have asked, my High 5 is being aired on KSL5 tomorrow morning at around 6:25 (possibly a few minutes earlier).